Nothing is as constant as change. The National Trust needed a change, they required a product to supersede and replace their failing existing fence. The original fence had stood for over 100 years, so it was a challenging brief. The previous fence was supplied and erected by Francis Morton & Co, Naylor Street Ironworks, Liverpool, constructional Engineers. Manufacturers of bridges and girders, roofing, steel-framed buildings, steel telegraph poles, fencing, gates and ornamental iron work. They employed over 700 workers, supplying approx. 30,000 tonnes of steel products per annum. 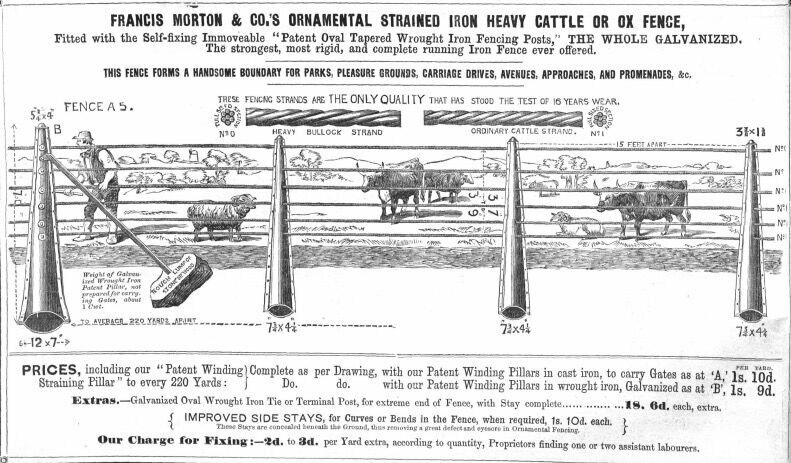 Their patented wire fencing system was first advertised in The Farmer's Gazette and Journal of Practical Horticulture, Saturday 9 July 1859. Their patented oval tapered canister galvanised posts and wrought iron ratchet designed strainers were revolutionary at the time. The past owners were certainly looking to invest in a product that would stand the test of time. This fencing system was being advertised for one shilling,10d (approx. 22p) per yard, equivalent in today’s money would be approximately be £45.22 per yard and with erection cost between 2d –3d (2-3p per yard) equivalent in today’s value at £5.89 per yard. It was a considerable investment to consider. With such a pedigree fence to compete against, which had certainly stood the test of time, longevity was going to be some formidable criteria to match. After discussions with The National Trust they explained they were looking for something that would give them a good return on investment, reduce maintenance and create an effective, unobtrusive fence. The other challenge, was the terrain, very steep almost inaccessible fence lines, situated close to Box Hill, which was used for the Olympic cycling race, this was not going to be an easy job. 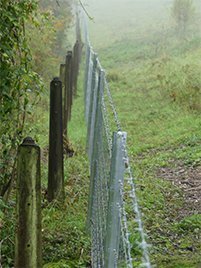 One of the National Trust rangers had witnessed Clipex fencing being used at another one of their properties, Cissbury Ring in Sussex, having seen it up and in situ she was surprised at how it blended into the scenery. 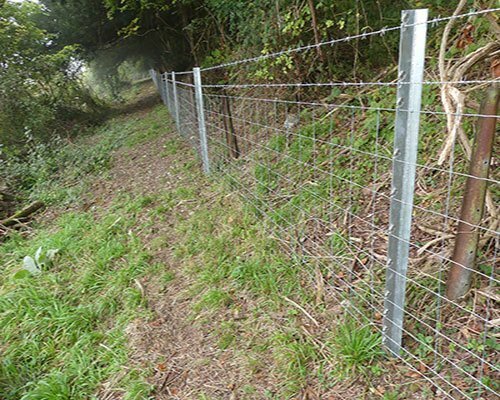 Clipex posts paired with X fence premium wire netting were considered to fence in the Belted Galloway cattle which helped graze this site of interest and conservation. After discussions with their fencing contractor Nathan Battershill of NB Fencing Services, it was the preferred fencing system that would answer all the questions, especially with a cost almost ten times cheaper than the original fence. Nathan was tasked with erecting the new Clipex fence line in front of the old existing fence. The Trust wanted to retain this for historical reasons, which as Nathan said, that is fine with me as these posts would require mechanical excavation, they are solid, even after all these years and that’s if you could get to them. Nathan had been as doubtful, as most, to the new concept in fencing, but was soon won over by the ease in which it could be installed. He initially thought that the post profile had been compromised over strength, but once he had erected them with X fence one piece vertical wire netting, he soon realised that this created a substantial fence. The post drove in a lot easier through the flint and chalk than timber would have done. Once he had understood the products and mastered the erection process he was very impressed with the speed with which it could be installed. Nathan said he will certainly be offering this type of fencing on future quotes and looks forward to using the product again in the very near future. Find out more about the innovative Clipex fencing solution.